The Australian Kelpie was initially developed in the late 1800's to work on Australia's sheep stations. Its name comes from Scotland and means 'the spirit of the waters'. This lithe, active, supple dog is never weak and is capable of untiring work with a natural instinct to work sheep as a Herding Sheepdog. The Australian Working Kelpie is one of Australia’s truly national dogs, a real Aussie icon. However its origins lie in Scotland, where a number of collie-types (Collie is Scottish for sheepdog) contributed to the development of the breed we know today. These founding sheepdogs, whilst not necessarily registered breeds, were developed within the various regions of Scotland. Some dogs more suited to the sweeping moors and others the Highlands. During Australia’s migrant boom in the 1800s, demand grew for a dog suited to working with the vastly developing Merino sheep population. This saw the import of many herding dogs from the homelands of new migrants, espcially the United Kingdom. Many breeds were brought to Australia, these few strains of Scottish working dogs were crossed together, and with a mix of good fortune and skills the Kelpie was born. These original strains have now all but disappeared. The Kelpie's origins can be traced back to six ”founders”, that means three pairs of parent dogs, that were imported independently from each other, by three different migrants. The Kelpie was first registered in 1902 and one of the earliest registered breeds in Australia. 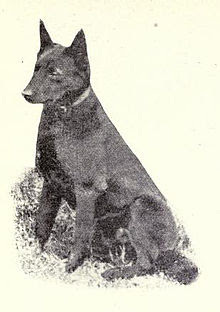 Australia's first Stud Book 'Tyzack's Annual' published in 1912 recognised the distinct breed type of the Kelpie, with 23 dogs listed there under the two combined names, 'Kelpies and Barbs', the latter being historically black. The Merino sheep has gone down in history as the catalyst for the development of Australia during the 19th and early 20th centuries. With no sheep on Australian soil prior to the arrival of the First Fleet (1788), the Australian sheep population exploded to a peak of 180 million by 1970, by far the highest population in the world at the time. 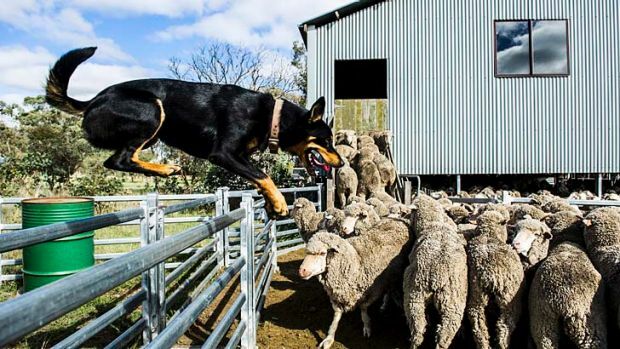 It is the special contribution of the Australian Working Kelpie which helped create this vast rural enterprise, and Australia, to flourish as it did. 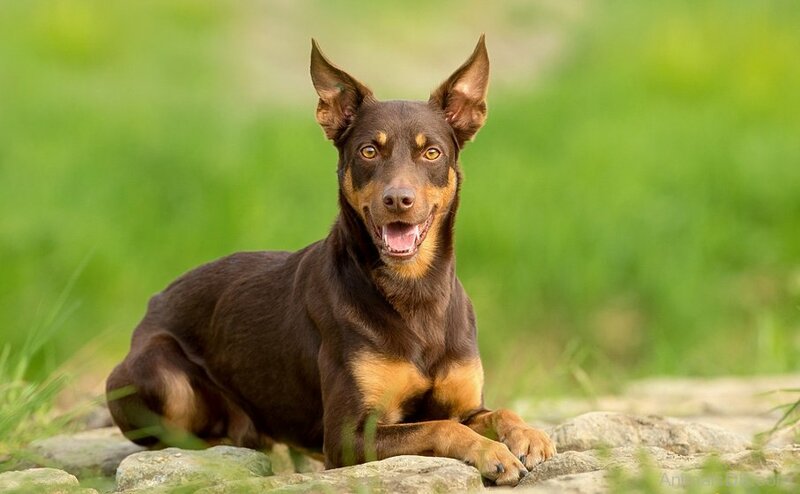 Since its inception, the Kelpie breed has developed into two distinct strains; the original Working Kelpie and the more recent class of ‘Bench Kelpie’ – a type specifically created for the show ring and more often seen as a pet rather than a working dog. Unlike the Bench Kelpie, the working dog is not bred for colour. 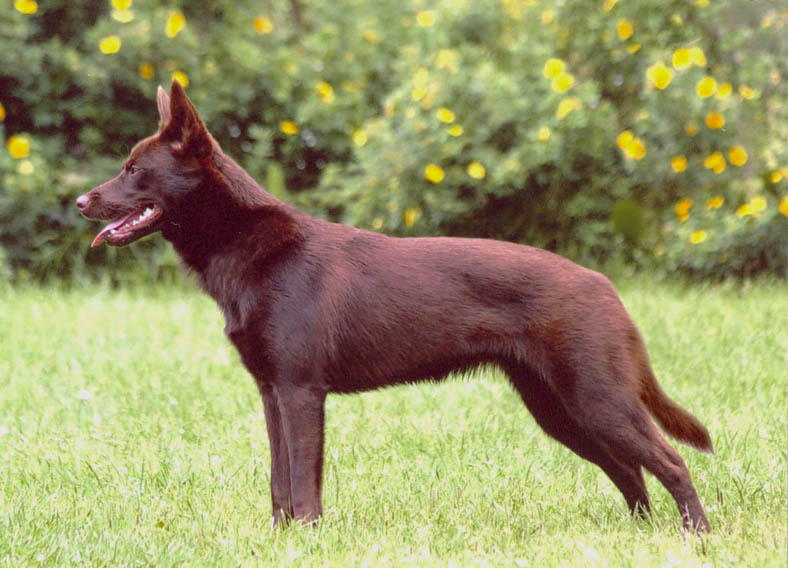 The black and tan is regarded as the truest colour of the Working Kelpie breed, though it may also appear in red, blue or fawn, with or without tan. Working Kelpies are slightly smaller than the bench type, which stands up to 51cm at the withers (like the Australian Cattle Dog). The typical double coat has a short thick undercoat covered by a hard, straight rain-resistant outer coat. 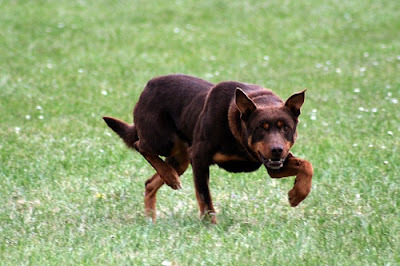 There is a definite ruff around the neck and mild breaching behind the legs.The Working Kelpie’s coat is also more coarse than the bench type. Kelpies are athletic with muscular shoulders and a strong hindquarter. The head is slightly rounded and broad between the eyes. Unlike the Bench Kelpie, the Working Kelpie is maintained in ‘working condition’, with a very trim, muscular physique devoid of unnecessary bulk or flab. Working Kelpies are tireless and hardworking and their intelligence is apparent to anyone who sees them in action. The dog’s desire to work amongst sheep is instinctive. Young, untrained dogs can be seen naturally mimicking the actions of the more experienced dogs, working their actions out for themselves based purely on hereditary factors. Kelpies are a very loyal breed, and are regarded as a ‘one man dog’. When selecting a new dog, stockmen may initially look for a pup which is naturally drawn to them. 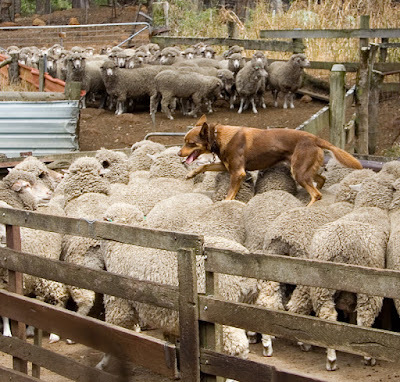 The stockman can then rely on this bond to be strengthened as the dog matures, making it easier to train the animal.As the dog matures and is introduced to sheep, stockmen will look for those animals which show a ‘willingness to comply’: wanting to work for their boss, not just for themselves. This breed needs space, lots of it! Running 50 or 60 km a day is usually no problem for this extremely active breed. Without physical and mental stimulation, Australian Kelpies become bored and hyperactive and will drive you crazy with obsessive, destructive behaviors as they seek creative outlets for their energy. This sharp-eyed, quick-thinking, fanatical workaholic must be allowed to do a job. A Kelpie can be a search and rescue dog, detection dog, hearing dog, assistance dog, or therapy dog. He’s also great at dog sports: agility, flyball, canine disc games, herding trials, obedience and tracking. The Kelpie is undoubtedly a special breed as he's capable of working in blistering heat, freezing cold and over great distances for days on end. 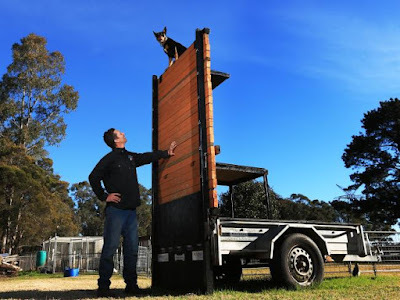 A good Kelpie is said to be worth many men and is most valuable in the paddocks and yards, gathering sheep, driving them to the yards and pens and forcing them up ramps and into sheds and trucks. Cast: A Kelpie is sent to ‘cast’ or ‘gather’ a mob of sheep when the farmer wants to bring his sheep to a certain point, such as the yards. The dog’s ability to cast long distances is invaluable and the best dogs will have a natural ability to do so. Hold: Working Kelpies require the ability to ‘hold’ a mob of sheep together. Sheep will instinctively remain together, but if pressured or startled, individuals can break away from the mob. A sheep which breaks away should be quickly gathered and returned by the dog. Keeping Distance: Sheep don’t always require constant pushing by the dog, especially if travelling long distances in extreme heat. A Kelpie must have the ability to keep some distance from the mob so that the sheep are permitted to walk along steadily. Kelpies which instinctively know when to apply pressure to push the mob forward and also when to ease back and keep distance are strongly desired. The dog must also quickly respond to commands requiring it to ‘stay’ and ‘walk in’. Backing: When a dog is required to leap onto the sheeps’ backs if they become jammed in the loading chutes. Eye: A dog is said to have a ‘good eye’ if he is able to steady his approach and watch the mob’s every move intently, controlling sheep with its eyes. The dog will often take on an exaggerated stalking motion. A dog which possess a ‘flexible eye’ is able to watch and read many sheep, ‘holding’ them with its gaze. The Working Kelpie is a very sound breed with an average lifespan of 12-15 years. Breed selection is not only based on temperament and intelligence but also health and conformation, unlike show dogs, which are bred to conform to a written standard (often to the detriment of the overall health of the breed). If kept for its intended purpose, the Working Kelpie is a low maintenance dog. The harsh, short coat doesn’t require grooming or clipping and there are no inherited health problems which may require regular care. A Working Kelpie is routinely exercised during a normal working day. However if you choose to keep a Working Kelpie as a pet, that very same animal may become a high maintenance dog. Daily, extensive exercise is required, and any dog not able to express their normal behaviour is prone to develop behaviourial problems. Obedience training is essential but there really are many other dog breeds which are more suited as a family pet. 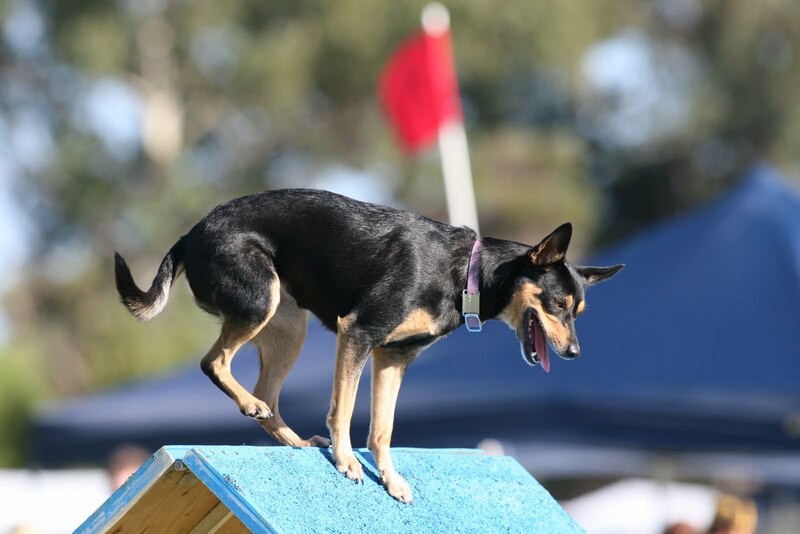 Australian Cattle Dog & Kelpie Club of QLD Inc.